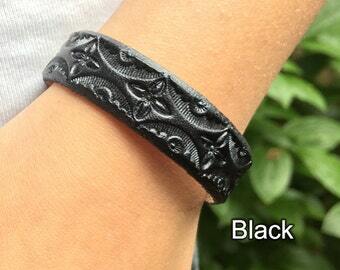 Kids leather diffuser bracelet - tooled design on leather - personal diffuser bracelet for aromatherapy - you pick the color! Announcement I have been tinkering around with more leather items, and now have a handful of re-fillable journals and knotted celtic necklaces to offer, along with my array of diffuser bracelets. I have been tinkering around with more leather items, and now have a handful of re-fillable journals and knotted celtic necklaces to offer, along with my array of diffuser bracelets. Diffuser bracelet with star pattern and pearl shimmery topcoat, hand tooled leather ready to use as a personal diffuser-you pick the color! Hand tooled leather bracelet in a chevron pattern - 1/2 inch wide, use as a diffuser bracelet with essential oils - you pick the color! My nephew loved his special birthday gift! I ordered 5 bracelets in different sizes & styles. The ordering process was super easy & the bracelets arrived pretty quickly. They are good quality and true to size. We’ve all enjoyed them with essential oils. Likely not my last order! Exactly like we wanted! Can't wait to work with this seller in the future - best high quality leather diffuser bracelet I've seen! Just a few pieces of equipment I use regularly. Hammer, leather, rivet setter, hole punches, rotary cutter, and piercer. I started my shop with a few crochet items, such as rugs and some bracelets. I learned how to knit and quickly added a few headbands to the pile. I still love creating crochet and knit pieces for people, but I've added leather working into my life and it has quickly taken over. Before my 3rd wedding anniversary, I saw the theme for that year was Leather. I decided I would make something for my husband from leather, not quite realizing what I was getting into. There were so many colors, choices, stamps, dyes, rivets, cutters, etc. I dove head-first into my creations and I've never looked back. I've even managed to incorporate some crocheted touches into some of my unique leather bracelets. Creating a finished product out of leather is very rewarding. You start with a blank canvas of leather, and turn it into a treasured item someone will love. I started out with cross stitch embroidery when I was very young, and this sparked a love of fibers. I've grown my skills to include sewing, knitting, crochet, embroidery and my most recent love: leather working. My name is Tamar and I strive to create beautiful, quality items that inspire and bring joy. Now that I have expanded my craft to include leather crafting, I feel like I tinker around in my workshop now more than every - hence my shop name: Leather Tinker. When you buy an item from me, I want you to be 100% in love with what you ordered. IF YOU FEEL YOUR ITEM WAS DAMAGED IN DELIVERY: Please contact me within 48 hours of receiving your package. I will gladly offer to exchange the damaged item with another of your choice or fully refund the purchase price upon return. EXCHANGES & RETURNS: I will gladly exchange or refund items returned in their original condition up to 14 days after the delivery date. Please message me through Etsy informing me that you are intending to ship something back. Refund will be issued, after item is returned to me, for the purchase price of the item(s), but not shipping. PAYMENT: I accept credit card payments with Direct Checkout through Etsy as well as Etsy gift cards. I also accept Paypal. If the item is small and can fit in a bubble envelope I will ship by USPS First Class mail because it is the least expensive. This will take 2-4 days in the U.S. or 6-10 days to Canada. I know that the Holiday season is a busy time and that you are anxious to get those presents under the tree. I'm working hard to ship all orders as quickly as possible and most orders are shipping before my listed processing times. Please place your orders by December 14th to ensure your package arrives in time. I will always provide a customs number, but be aware that tracking is limited and there can be delays in delivery. Allow a full 45 day before considering it to be an issue. EUROPE - - Delivery could take up to 20 days depending on your area. ALL OTHER DESTINATIONS - - Delivery could take up to 30-45 days depending on where you are located. DUTIES /TAXES - - Please be aware that as the seller I do not pay for any applicable duty, value added taxes (VAT) or import consumption taxes levied by your country. The recipient of the merchandise/buyer might be required to pay the duty or VAT upon delivery. Please check with your customs/postal office to find out what those fees are. Here is a link that might help you www.dutycalculator.com/new-import-duty-and-tax-calculation. If for any reason you are not aware of this and wish to cancel this transaction, please let me know in 24 hours and I will be more than happy to. INVOICE AND CUSTOMS FORMS - - I will include an invoice with each package that corresponds with the customs form stating the full purchase price of each order. All International orders will be marked as Merchandise or Other- not as Gift. It is a Federal Crime in the US to mark the Customs forms with the Incorrect information. I understand how upsetting it is to place an order and not receive it when you expect to. If you order from me and do not receive your package, please know that I will do everything that I can to assist in getting your order to you. This will require mutual cooperation between both you and myself, as there are steps that will need to be taken on both sides in order to resolve the issue. I ask that you have patience while working through the process and taking all necessary steps. Please make sure that your shipping address is correct in your Etsy and/or PayPal account. I ship to the address on file, and if your Etsy address differs from your PayPal address (if you are paying via PayPal), I will ship to the PayPal address. If you need to make a correction to your address after purchase, you will need to cancel your order, make the correction, and then reorder. If you ordered a pre-made item and your package is returned to me due to an error in your address, you can request a refund of the purchase price of your item (shipping charges will not be refunded), or I can invoice you additional shipping charges to reship the package. If you ordered a custom item and your package is returned to me due to an error in your address, I can invoice you the additional shipping charges to reship the package. If you provided an incorrect address and did not receive your package, and it was not returned to me, I cannot be held responsible for the non-delivery. For this reason, it is essential that you make sure that your address is correct when you order. 1. First, please be patient. Packages are sometimes scanned as delivered before they are actually delivered. Please wait to see if the package is delivered the next business day. You will need some information from me in order to make this report, such as the date mailed, tracking number, etc. Most of this should be available on your Etsy invoice, and if there is additional information that you need, I will provide this via Etsy convo. Please complete the form within 48 hours of receiving the information from me. 3. Provide a copy of the completed "Mail Theft-Mail Not Received" form, the receipt showing submission to the USPS, and the police report, to me. These can be emailed to me at leathertinker [!at] gmail.com . If your package was insured, I will give you a timeline for the insurance reimbursement and replacement or refund once I have filed the claim. I realize that it is very upsetting when you have made a purchase and do not receive the item(s) that you paid for. My goal is to resolve the situation fairly for all parties involved, and in order to do that, must go through all of the above channels to ensure the best possible outcome for all. Your patience and understanding are appreciated, as well as your willingness to communicate and respond to my communications promptly. Rest assured that I will do everything I can to resolve the issue, and your cooperation in the process will expedite the process. All item's in this store are located in and shipped from Eugene, OR 97405 - USA. Each item has been carefully crafted in a pet and smoke free location - flaws - if any will be mentioned and photographed. * Payment is due in full before an order is begun. * The terms of each order will be agreed upon before a listing is created and before payment is made. * If this item is needed quickly, please let me know right away so that I can accommodate your needs. * Please see shipping policies for information on how your order will be shipped.